Having a Prius hybrid has allowed me to avoid solar for my Prius Campervan, as the Prius is an efficient generator that supplies all the power I have needed, including recharging my house battery. I am reconsidering my decision about solar after moving to LiFePo4 for my house battery. Lithium battery technology is a great battery for evaluating solar too as it doesn't develop a memory. Not to mention the number of people who follow this blog that are curious about my thoughts on solar, as well. Not covering how to include solar in my Prius Campervan left me wondering about how to do it too, as a big part of me having a Prius to travel in was to reduce my carbon footprint. 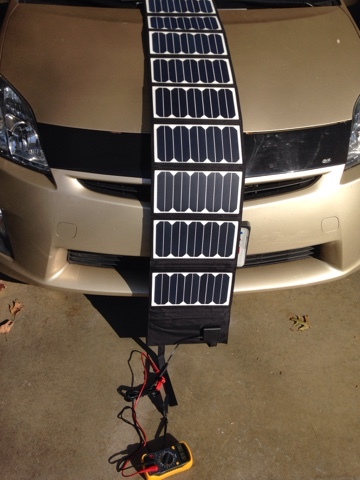 Without solar I have to run my Prius engine adding my bit to the global carbon emission problem. So my first caveat is that solar is not necessary, but it is possible and even has advantages over using Prius as a generator. 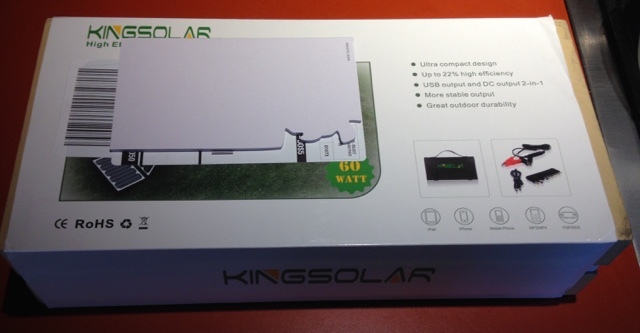 I wanted sufficient solar to offer a significant nudge to the Lithium battery so i decided on a 60 watt panel marketed as Kingsolar made in China vs a smaller wattage panel. 60 watts is a good first step as this panel provides both a USB output and 18 volts to feed the battery. Although this panel comes with the needed items to connect directly to the battery, do not do this. It is possible to do this for lead-acid batteries provided you monitor the battery (so it is not overcharged), but my LiFePo4 battery needs a specific charge and and float voltage. 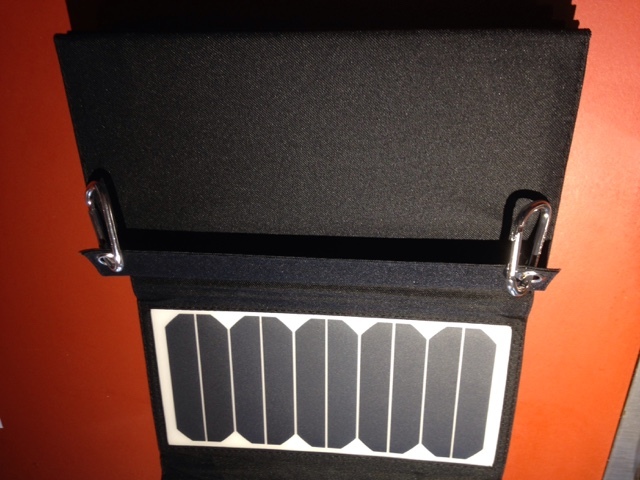 Above are the accessories that come with the solar panel. The barrel plug to barrel plug cord allows you to change the barrel plug end with the various tips that may fit your computer charging at 18 volts or what is put out by the solar panel. The barrel plug to 2-wire quick disconnect you to hook into the battery clip cable to charge your battery directly. I will not be using this on the lithium battery. What I will use is the USB output at 2.1 amps to charge my USB devices. 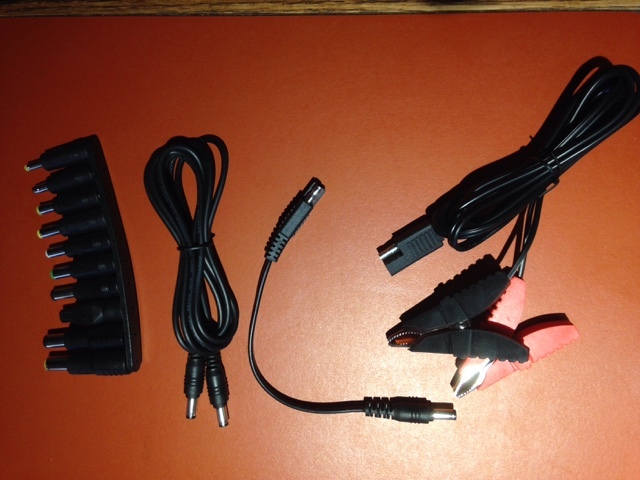 I will use the barrel plug to 2-wire quick disconnect to hook to my LiFePo4 battery to a specific charge controller. I will be introducing the charger controller in a different blog post. At $165.99 from Amazon solar is an investment that can only be recouped with proper consistent usage. This solar panel is not my first entry into solar when I travel. I have a 7 watt Goal Zero panel to charge 4 AAA or 4 AA batteries I use for things I carry. 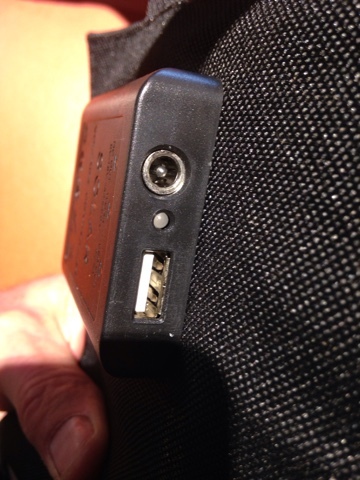 I can also carry the charger to feed a USB cable to recharge my phone when I am hiking or away from charging source. 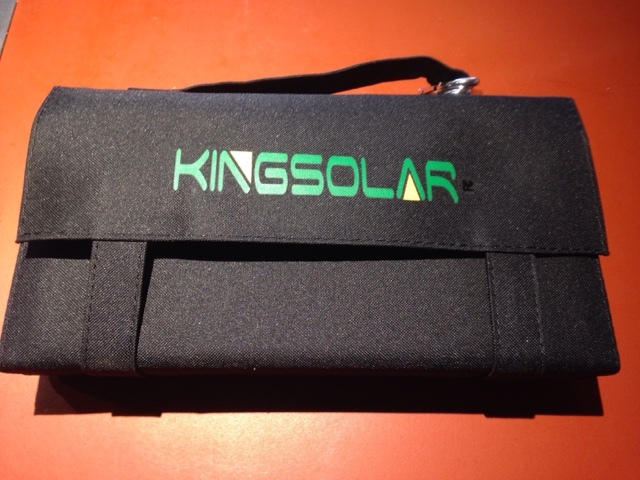 This KingSolar solar panel is meant for travel as it folds up and can be carried in a backpack. The reason for buying a folding panel is to have a small footprint product that I can easily store in the Prius. I was asked about using a Renology 100 watt solar folding panel but I did not have space for such a large object in the Prius. I keep my front seat mostly clear other than coat and hat to maintain a stealth look. I would not want a solar panel visible as it can draw the wrong attention. Above is a brief spec on the back of the solar panel. My focus is on the 18 volts at 3.3 amps for feeding a charge to my lithium battery through the charge controller. 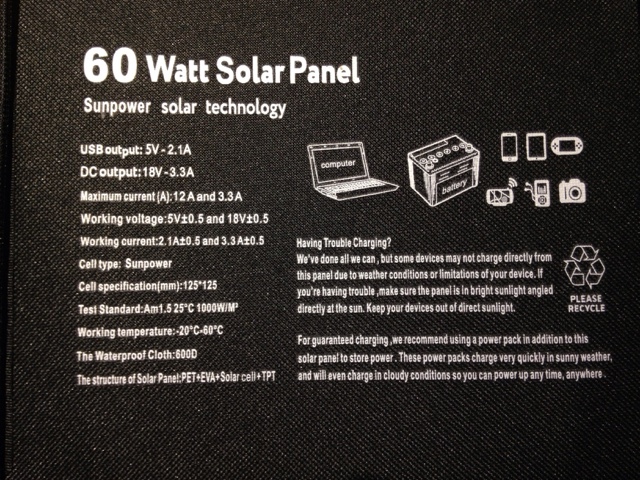 On the bottom right side is a statement that recommends using the solar to charge a power pack. 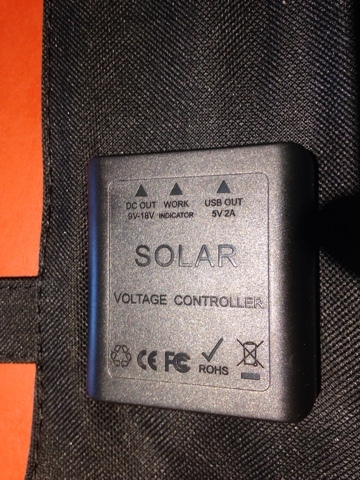 The marking of the back of the solar controller that is attached to the solar panel. Above you see the end of the solar charge controller with USB connection on the bottom and in the middle is a blue LED that lights when the panel has power for charging. The light gets brighter when the solar power is stronger and lighter when weaker. At the top is the barrel plug with 18 volts that appears to be just fed directly by the solar panel. When testing the voltage changed when I moved the panel. The solar charge controller addresses this issue. Awhile ago while at Harbor Freight I bought a box of spring clips. Above I added one to each hole used to hang the panel. They get removed when the panel is folded and I hook them to the handle of the panel. My first test location was the front of the Prius, hanging over the hood. I hooked the panel to the windshield wiper arm. The Prius has two good sloping surfaces on the front and back to lay the solar panel. The solar panel out of the box worked well. 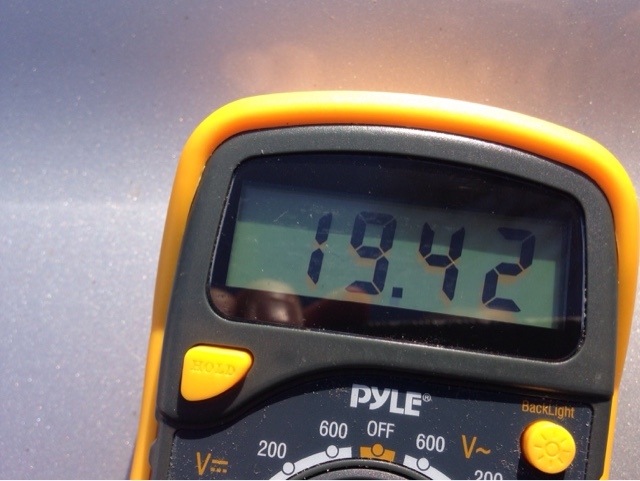 Here is my measured 19,.42 voltage in full sun without clouds. This high unregulated voltage is why you need a charge controller. My choice of a charge controller will be discussed in another blog. For now I am ready for the next step in my solar migration and hooking up the charge controller to condition the raw voltage for the LiFePo4 battery. "I am reconsidering my decision about solar after moving to LiFePo4 for my house battery" <- is this because lithium batteries take a charge more easily/ more quickly, especially while topping off? To get your old house battery to reach 100%, perhaps it took too much gas because that last 20% takes a long time with an AGM? Or maybe the new battery has more capacity than the old, so you didn't want to run your car longer to charge it period? Or is it just the techie in you who had to try solar (:p)? I was really hoping to avoid solar in my hybrid setup. I wonder if a calculation can be made as to what is more cost effective over time. Also, when do you think you'll get to use this panel? While bookdocking and no one is around to swipe it? Else you need to babysit it for theft? :( Certainly looks like a nice piece of kit though. Q: - is this because lithium batteries take a charge more easily/ more quickly, especially while topping off? Ans: Yes, in part - you can add as little or as much as you need to the LiFePo4 battery without it developing a memory. Q: - To get your old house battery to reach 100%, perhaps it took too much gas because that last 20% takes a long time with an AGM? Ans: Gas was not a big concern although it does drop my mpg. Q: - Or maybe the new battery has more capacity than the old, so you didn't want to run your car longer to charge it period? And: My LiFePo4 has 27 usable amp hours vs my gel cells having a usable 12 amp hours. Solar isn't needed to get the charge into the higher capacity battery as I have switched to a 10 amp charger to reduce the time to charge the battery. Q: - Or is it just the techie in you who had to try solar? And: Yes, Yes. As I noted in my post solar with a Prius was not a necessity. I've lived two years on the road and solar wasn't a necessity. Solar can help charge the battery when stationary and able to monitor my panel, but being stationary is not a big part of my travels. This is why my choice of folding solar panel comes in handy as I can take it in hikes too or to the park and use it to charge USB devices. Q: - I was really hoping to avoid solar in my hybrid setup. I wonder if a calculation can be made as to what is more cost effective over time? 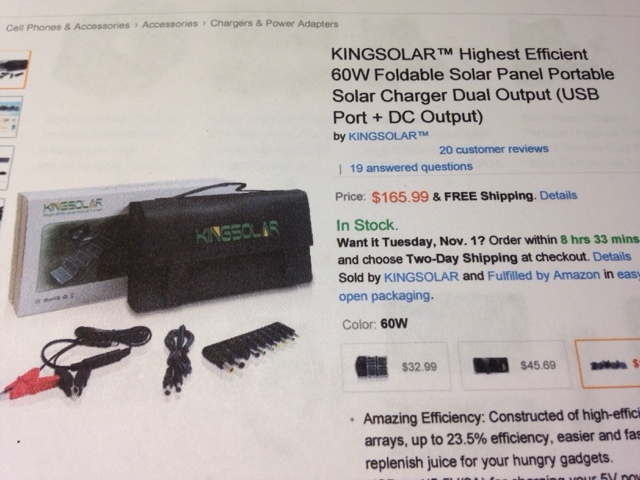 And: What I will spend on the solar panel, solar charge controller, and connectors will total about $250. I will not make up this cost in one year or possibly two as I drive too often. I will have fun trying it out and reporting on it. Q: - Also, when do you think you'll get to use this panel? While bookdocking and no one is around to swipe it? Else you need to babysit it for theft? Ans: Yes. I will only use when boondocking like at the RTR and GTG and when I hang out at the park or go on hikes as it fits in my backpack. I will have a passive lock for it but I will be around to keep an eye on it. Well it seems like you've found a nice balance of compact design, price, and something that's not just a "toy" from Harbor Freight. :) BTW, what does it weigh? I might throw it in my backpack while puttering around town or on the bicycle, but probably not while hiking/backpacking. I was looking for "that balance" and I think I have it but the test will be when I'm at the RTR in January to test it out and report on what I find. The solar panel by itself is 2.8 lbs without your choice of cables. The solar panel is conducive to laying on the ground provided nothing hits or steps on it.